Zion Market Research has published a new report titled “Arthroscopy Instrument Market by Product (Arthroscope, Arthroscopy Implants, Visualization Systems, Fluid Management Systems, RF Ablation Systems, and Powered Shaver's), by Application (Knee Arthroscopy, Shoulder Arthroscopy, and Others), and by End User (Hospitals and Ambulatory Surgery Centers & Clinics): Global Industry Perspective, Comprehensive Analysis and Forecast, 2018 - 2024”. According to the report, the global arthroscopy instrument market accounted for USD 4,050 million in 2017 and is expected to reach USD 6,222.5 million by 2024, growing at a CAGR of around 6.34% between 2018 and 2024. An arthroscopy is a surgical procedure performed by orthopedic surgeons to visualize, diagnose, and treat the problems in joints. The procedure involves a small incision in the patient’s skin and insertion of small pipe sized instrument that contains a small lens and light source (fiber light) to examine the inside structure of joint, the light is transmitted through fiber optics. An arthroscopy is usually performed for a torn meniscus, rheumatoid arthritis, cubital tunnel syndrome, elbow pain, and problems, etc. Rising demand for robotics and autonomous systems in arthroscopy instruments for minimally invasive surgeries and expansion of healthcare expenditure in developing countries are acting as future opportunities for arthroscopy instrument manufacturers. Based on product, arthroscopy instrument market is segmented into arthroscope, arthroscopy implants, visualization systems, fluid management systems, RF ablation systems, and powered shavers. Arthroscopic implants segment hold the highest share of the global arthroscopy instrument market due to the use of implants in the majority of the arthroscopic surgeries. Based on application, the arthroscopy instrument market is segmented into knee arthroscopy, shoulder arthroscopy, and others (hip, wrist, elbow, foot, and ankle). 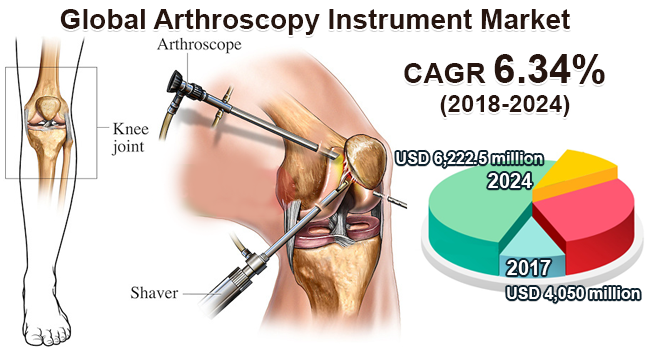 Knee arthroscopy segment has contributed the highest share to the market growth and the other segment is expected to grow with highest CAGR due to rise in hip surgeries and growing availability of advanced instruments for complex hip surgeries. Based on the end-user, arthroscopy instrument market is segmented into hospitals and ambulatory surgical centers & clinics. In 2017, hospitals segment accounted for the largest share of the global arthroscopy instrument market. Based on geography, arthroscopy instruments market has segmented into five regions: North America, Latin America, Europe, Asia Pacific, and the Middle East & Africa. North America held the largest share of global arthroscopy instruments market in 2017, owing to about 2 million sports-related surgeries performed each year in the U.S. only and the presence of key market players in the region. Europe has the second largest share of arthroscopy instruments market due to rising prevalence of bone-related disorders and government support for research and development. Asia Pacific region is expected to grow with the highest rate mainly due to rising demand for minimally invasive surgeries, growing geriatric population, and expanding healthcare expenditure. Some of the key players in arthroscopy instrument market are Arthrex, DePuy Synthes, Smith & Nephew, CONMED, Stryker, Medtronic, Zimmer Biomet, B. Braun, Karl Storz, Olympus, MEDICON, Sklar, Millennium, and GPC Medical. Zion Market Research is an obligated company. We create futuristic, cutting-edge, informative reports ranging from industry reports, the company reports to country reports. We provide our clients not only with market statistics unveiled by avowed private publishers and public organizations but also with vogue and newest industry reports along with pre-eminent and niche company profiles. Our database of market research reports comprises a wide variety of reports from cardinal industries. Our database is been updated constantly in order to fulfill our clients with prompt and direct online access to our database. Keeping in mind the client’s needs, we have included expert insights on global industries, products, and market trends in this database. Last but not the least, we make it our duty to ensure the success of clients connected to us—after all—if you do well, a little of the light shines on us.